All transactions are safe and secure with a reliable history in online purchasing behind each of our associates. Buy the Ariel t-shirt to own Little Mermaid clothing and merchandise. This Disney Ariel t-shirt not only highlights her preference for dreaming, it reflects her colorful personality as well. It was designed with fans of the character in mind. If you can't get enough of her underwater adventures but are looking for designs that showcase the other characters, then keep swimming through our Little Mermaid clothing. We have plenty of options, so you are bound to find something that fits your personality perfectly. 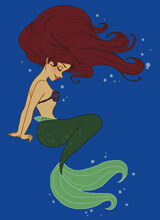 Don't miss other merchandise like Ariel dolls, books and Little Mermaid bath toys that any fan would love to have. Get one for yourself and give one to a friend! In addition to the Ariel tee above, browse the Little Mermaid Clothing Gallery for more apparel like men's and women's clothes, kids shirts or hoodies.